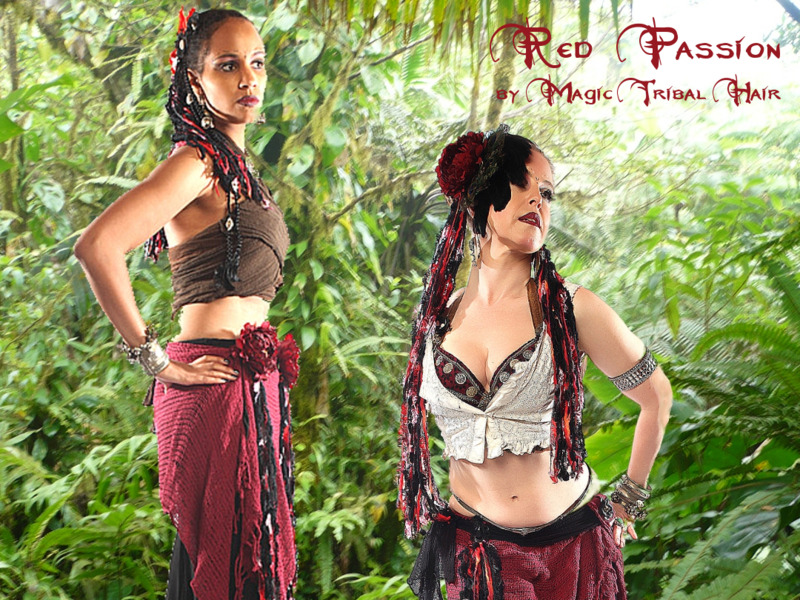 Red Passion was the very first tribal fusion belly dance collection by Magic Tribal Hair. I saved some material for the 10th anniversary to be able to offer you some pieces again in this retro collection! A Red Passion Start in 2009! And for a very simple reason: Wine red, red and black are among my personal favorite colors! So seeing the basic red passion yarns, the model popped up in my head by itself! Actually this yarn fall was the very first hair piece of all Magic Tribal Hair pieces! You loved it, too, so I gathered a huge stock of yarns to continue this model, but one fine day this stock ended as well. Luckily I had the idea to hold back some material just in time for a special occasion. And voilà - it's our 10th anniversary, what could be more special? Pictures say more than words, here is the Red Passion Yarn Fall - 3 very last pieces are available in the shop, now! Red lilies (sold out), but check these dark red lilies here (only some pieces left!) and these very precious red amaryllis hair flowers! Another piece of retro hair jewelry: Our black flowers are back, click here! The braids with belly dance buttons are handmade to order in your hair color and here in our shop among other fantasy clip hair pieces! You can get them with gold colored belly dance buttons, too! The First Hip & Hair Tassels - Model Red Passion! The Red Passion model also contributed to my invention of hip & hair tassels with the professional clip attachment as you know them! Previously I offered fringe bundles - ready to sew to your costume skirt, belt or pants. But I absolutely prefer versatily accessories that can be matched and used with other costumes, too, such a removable version is way more practical! When I had made the first tassel clip I even discovered more advantages: This piece of belt jewelry is a great hair piece or hair jewelry as well - presented below by belly dance star Apsara Habiba. For you this means paying for one item you can use with several costumes and as hair piece as well! There are 8 very last Red Passion hip & hair tassel clips waiting for you in the shop here! Last But Not Least - Red Passion Fascinators & Hair Jewelry to Round Off Your Set & Costume! Feather fascinators and headpieces matching our tribal fusion belly dance collections are back in our anniversary year 2019! All Red Passion models are already here in the shop! Some models will only be available in very limited quantities, for example the ones with the large peonies. I have only a few pieces of the peony blossoms left and could not find them again in the precious quality I need, which is a general and unfortunate problem with hair flowers at the moment. Quantities are displayed in the shop, when there isn't any information about quantities you can be sure that I can still make respective model many times. There are some hair pieces in these pictures, too! The crown of hair roses is here in our shop! Naturally it will be handmade to order in your hair color like all Magic Tribal Hair pieces of synthetic hair! The club curls are here! The yarn falls are not part of the headpieces but Red Passion hip & hair tassels I mentioned above (second picture). I stopped selling at bazaars quite a while ago to focus on custom orders, the last bazaar event was the World of Orient in 2012. I had almost forgot some smaller boxes with neatly stored, unsold hair jewelry inside! Naturally I myseld did not have any clue what I hid in these boxes almost 7 years ago! Among others I discovered 1 piece of the left hair flower set and 2 pieces of the right one - you find them both here in the shop! Naturally the other hair jewelry will not remain in pandora's bazaar boxes and be stored for another 7 years, I will have more retro collections for you, soon ;)! The cute tribal hair buns are made of these two braided braid hair pieces that have been pinned up into these buns! The doll's braided updo is here in the shop - handmade to order in all hair colors, of course! One of these beautiful faces might look familiar to you, and yes, it's her - belly dance star Apsara Habiba who posed and danced for me and my items during the first professional photo shoot I had with photographer André Elbing (he's among the top photographers of the European belly dance and tribal fusion community!). Here's Apsara Habiba's website or click here for her page on Facebook! And here's André Elbing on Facebook! I hope you like these news and you can be sure, I am already working on more surprises!